WENT TO ILFORD MB. 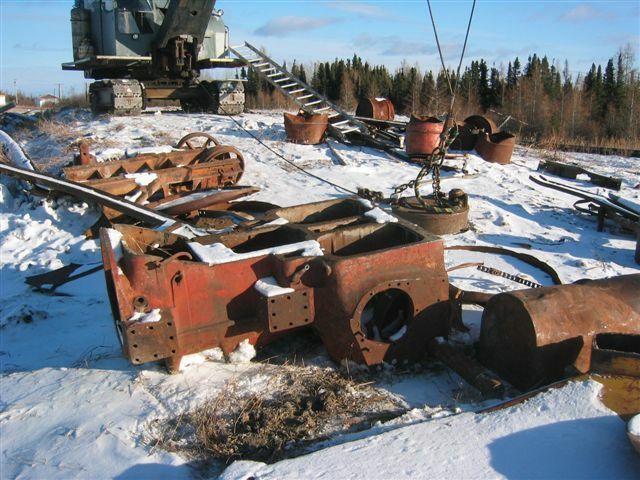 TO CLEAN UP THE TOWN OF SCRAP METAL AND ADD SOME OLD WINTER FREIGHTING EQUIPMENT TO MY COLLECTION OF OBSOLETE GOODIES. THIS HAS BEEN A 3 YEAR PROJECT WITH NUMEROUS REPORTS TO THE GOVERNMENT ON WHY THEIR IS NOT MORE RECYCLING IN THE GREAT WHITE NORTH. MY SCREAMING FORD SEMI WITH THE 318 DETROIT ENGINE LOADED ON THE RAILCAR FOR THE 4 HOUR TRAIN RIDE TO ILFORD, MB. 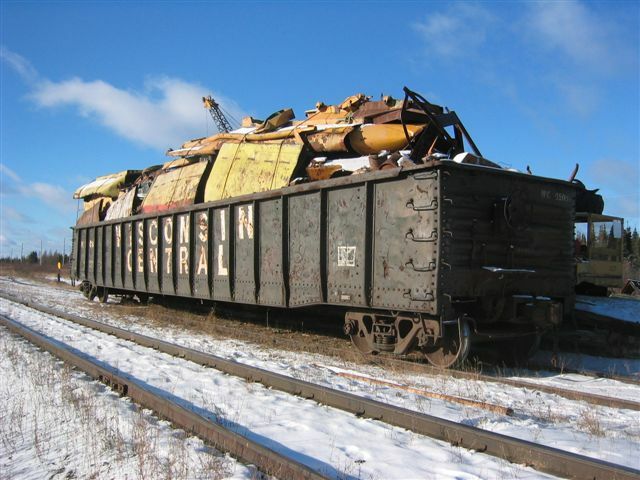 THIS IS A RAILCAR OF SALVAGE PLUS IT IS THE CHEAPEST WAY TO SHIP THE EMPTY OXYGEN BOTTLES OUT OF ILFORD, MB. 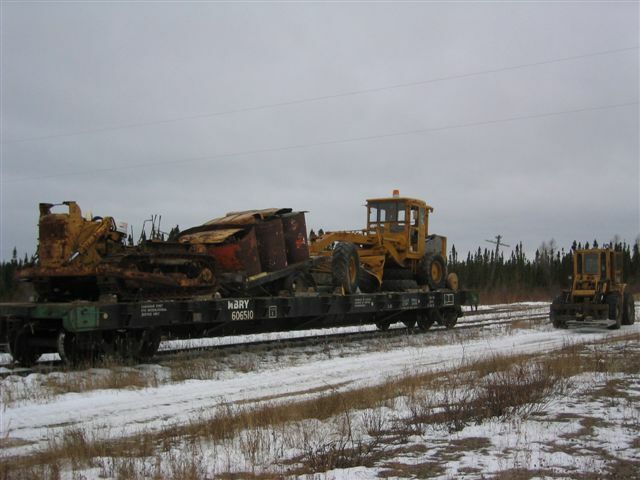 ON THE RAILCAR IS A D6 9U KNOWN AS "THE HOOD" (IT WAS SUNK WITH THE "BISMARK", TO READ MORE ON THIS CLICK ON http://www.kingofobsolete.ca/Newsletter15.htm ) A TRAILER OF SALVAGE AND MY BUDDY BARRY'S PARTS GRADER. THIS IS THE TOWN OF ILFORD, MB. IT WAS THE BIGGEST WINTER FREIGHTING HUB OF THE NORTH AT ONE TIME. ITS CLAIM TO FAME IS THE 1930S GOD'S LAKE GOLD MINE. 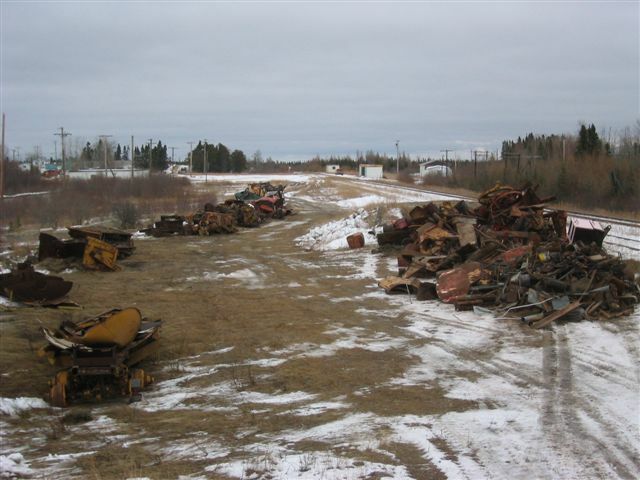 (TO READ MORE ON THIS, CLICK ON http://www.kingofobsolete.ca/Newsletter6.html ) THE PILES OF SCRAP ARE WAITING TO BE LOADED IN THE RAILCAR WHEN EVER IT SHOWS UP. 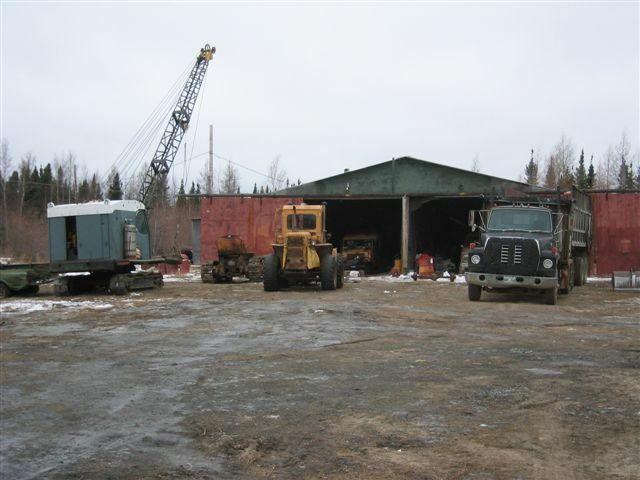 LOOKS IMPRESSIVE WITH ALL MY OLD EQUIPMENT IN FRONT OF KIP THOMPSON'S FREIGHTING SHOP. NOW YOU SEE WHY I'M THE "KING OF OBSOLETE" WITH MY OLD STYLE EQUIPMENT. 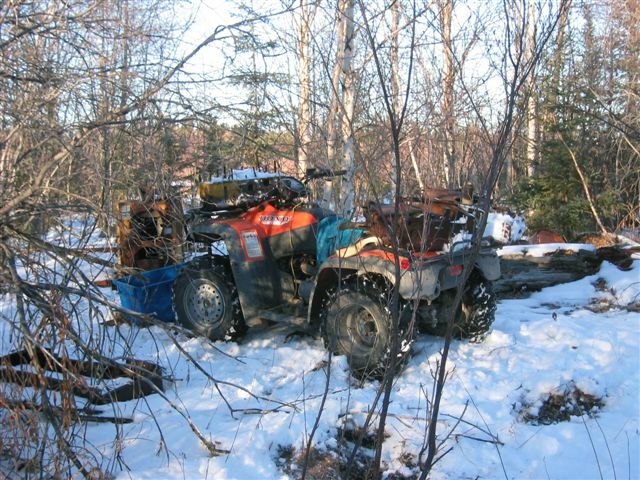 I BORROWED A QUAD TO GATHER PARTS FROM THE OLD CAT TRAIN SHOPS THAT HAVE LONG BEEN ABANDON. LOTS OF GOOD STUFF. 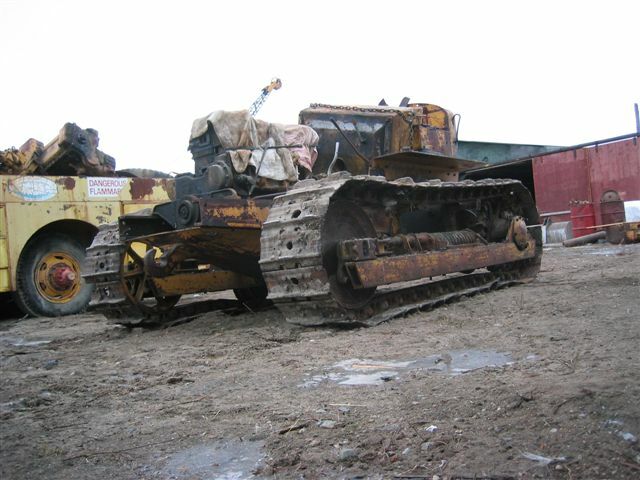 THIS IS THE D6 9U KNOWN AS "ROLLER-LESS" BECAUSE HE HAS NO BOTTOM ROLLERS ON HIS TRACK FRAMES. HE IS A TYPICAL WINTER FREIGHTING CAT WITH NO BLADE OR ARMORMENT. 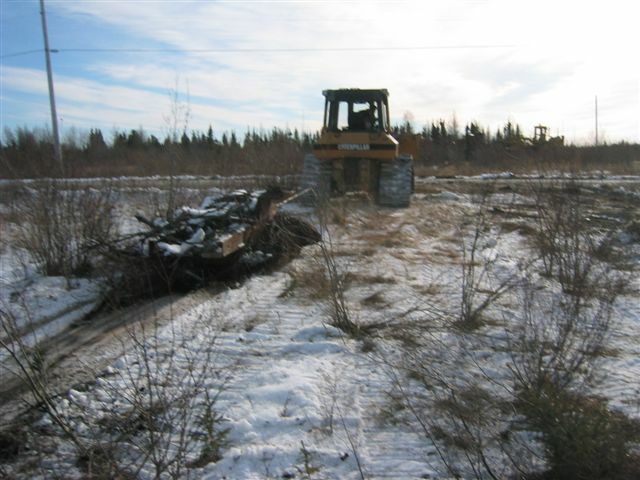 THE SEAL BLEW OUT OF THE STEERING CYLINDER ON MY 922 LOADER, SO SINCE I'M TRAPPED AT THE END OF THE WORLD AND COULD NOT FIX IT PROPERLY. I USED THE TROUGH AND THE PAIL TO RECYCLE THE OIL. 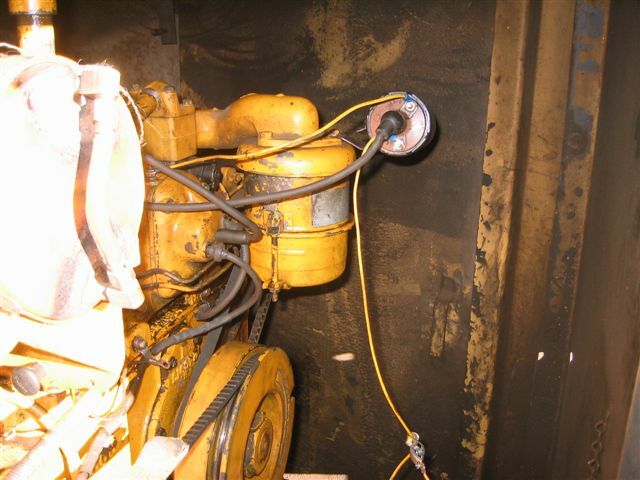 IT WORKED GREAT AND NOW THE CYLINDER IS IN EDMONTON BEING REPAIRED. 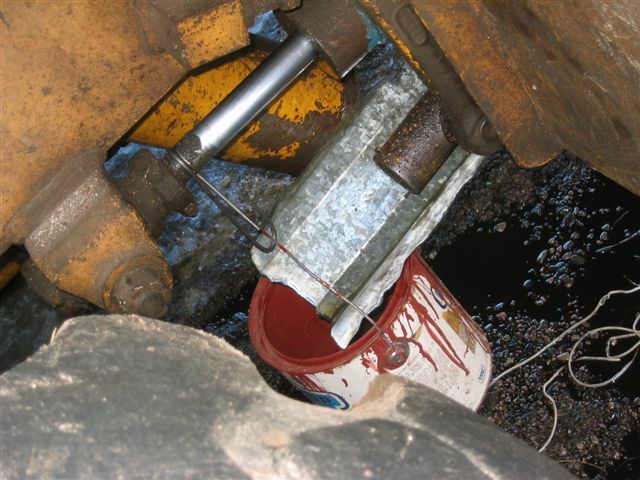 EVEN MY MAGNETO ON THE 15B DRAGLINE DECIDED TO QUIT SO I HAD TO MAKE A TEMPORARY REPAIR. 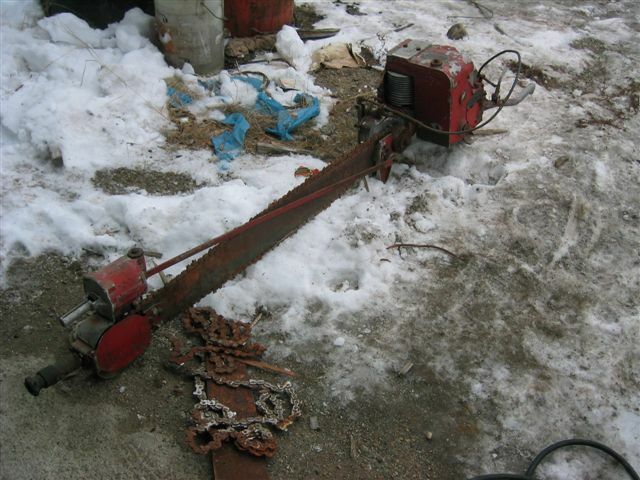 THE 2 MAN CHAIN SAW THAT I TRADED TO A FELLOW IN UTAH FOR CHEESE WHIZ. I DECIDED I BETTER DO THAT BEFORE I HURT MYSELF WITH THIS BEAST. 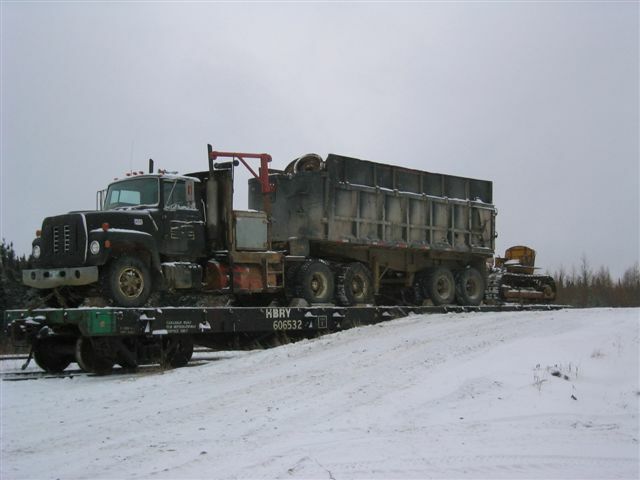 THIS IS THE WAY WE LOAD SCRAP IN THE GREAT WHITE NORTH. ANOTHER SAVE LOAD WHEN IT IS DONE RIGHT. 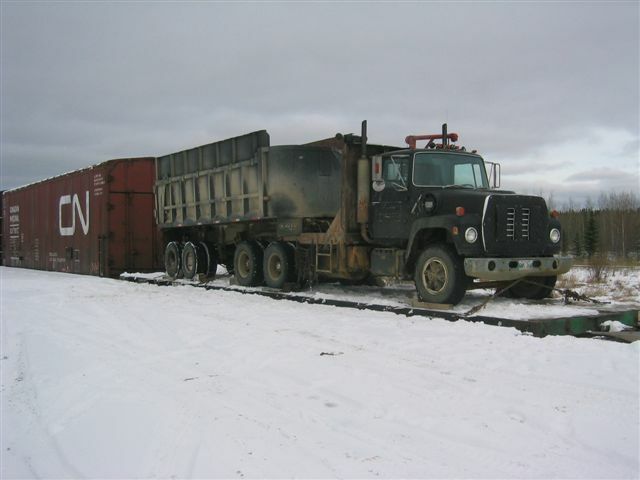 THE FORD SEMI LOADED ON A RAILCAR WITH "ROLLER-LESS" FOR THE 4 HOUR TRAIN RIDE THAT TOOK 12 DAYS TO COMPLETE. THAT IS A VERY LONG STORY WHICH I'LL TELL LATER.